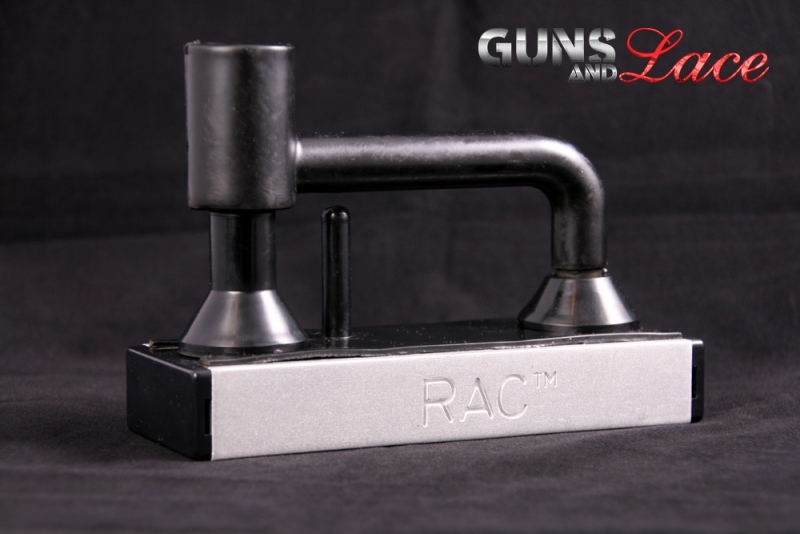 The RAC gun locking system is designed to hold and lock a gun into a secured bracket that opens with a key lock. You place your pistol, revolver or rifle into the RAC and then swing the arm closed and lock the device with the key. The firearm is secured by the lock and as long as it is bolted to something solid using the lag bolts that come with the unit or other hardware, you should've a pretty secure storage device that protects the firearm from theft and from the curiosity of your children. Along with handguns, which we found to be the most practical to store due to their size, the RAC can also store rifles. We found rifle storage to be the best when the RAC was mounted to the wall vertically. However, I like to store my rifle horizontally. One of the things that drew me to this unit, was that at Shot Show 2013, we saw the RAC displayed with an additional support bracket for the muzzle of an AR15. This muzzle support allowed for horizontal rifle storage on a wall or in the trunk of a vehicle. The owner and sales rep promised they would send us a bracket for this review, but never did. Follow up emails went unanswered. According to the company website LA, Las Vegas and Detroit Law enforcement are using the RAC. The muzzle bracket doesn't appear on their website as a product that can be ordered, but I expect a simple Simpson Bracket from the hardware store, with a little felt glued onto it would suffice. Since we bought the product, it appears that Remington has purchased the RAC and I expect that once they get their hands around the company they purchased, customer service should move back in line with industry standard. The product comes with a lifetime warranty. The system uses a pin inside of the trigger guard which helps to immobilize the weapon and isolate the trigger on most firearms. 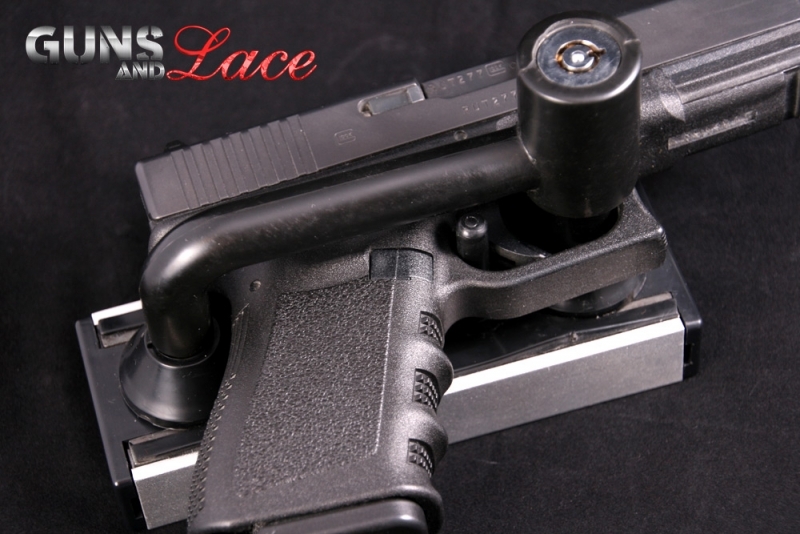 The parts are rubberized to help protect your gun from being scratched. I cannot stress enough clearing the weapon first before placing it in the RAC. The packaging and web site warn, "Do not lock loaded guns on the RAC!" and I can understand why, since there is heavy interaction with the trigger and the holding pin on the bracket that enters the trigger guard. 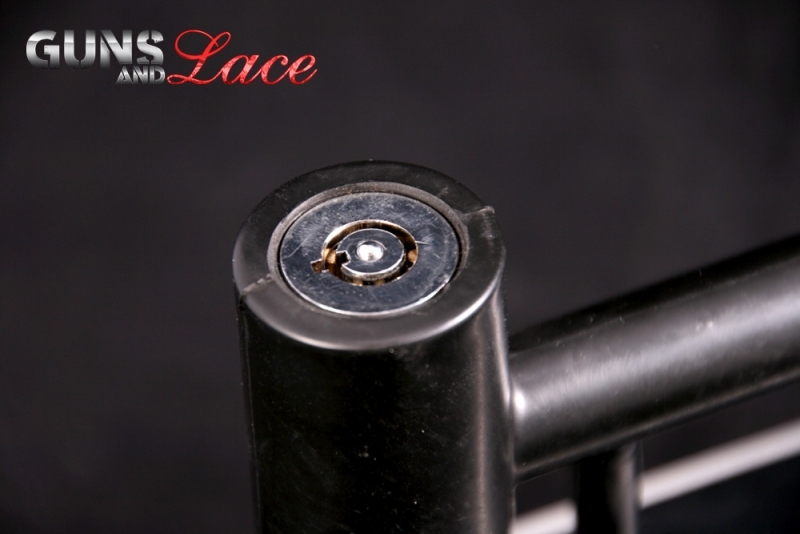 What the RAC is, is a better way to lock up a gun than a trigger lock or a cable. It provides a nice alternative for a household that only owns one or two firearms, where the expense and heavy haul in of a full size gun safe is probably just not going to happen. What it isn't, is a quick access device for grabbing a loaded gun for self-defense, we still feel a quick access drawer safe is best for a locked and loaded self defense firearm. To retrieve the locked firearm, you insert the key, unlock the device, and swing the arm away. The RAC comes in two configurations, a single gun RAC and one designed with longer pins for two guns stacked. Each RAC comes with three plates that slide in and out to accommodate different firearms and their sizes. The mounting bolts are under the plates and so can't be reached for tampering to removing the unit while closed and locked. 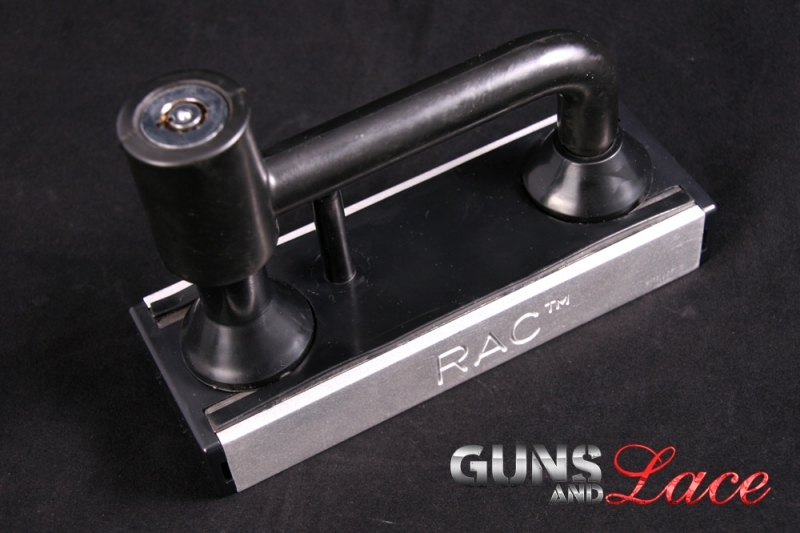 Overall, we found the RAC to be an affordable and smart way to store a rifle or handgun and keep it secured on a wall. While I do not feel the RAC replaces a stand alone gun safe for storing your gun collection, the RAC is an affordable choice for keeping a firearm out of the reach of children and secure so that it will not walk away. It definitely beats a trigger lock on a loose firearm leaning in the corner of a closet. I'll be using the one I bought to secure one of my own firearms at home. I look forward to the Remington reputation for outstanding customer service and follow up catching up with the RAC product. WOW, What A Great Idea, Very Cool! !